Daniel Rosenblum, Deputy Assistant Secretary for Central Asia, Bureau of South and Central Asian Affairs, Tom Malinowski, Assistant Secretary, Bureau of Democracy, Human Rights, and Labour, both of the Department of State, as well as Jeff Goldstein, Senior Policy Analyst at the Open Society Foundations, and Ms. Allison Gill, an independent expert on Central Asia, spoke before the congressional commission. Among the speakers was Sanjar Umarov, who was once convicted in Uzbekistan for his political views. Mr Umarov also was a successful businessman, public figure, oppositionist and leader of the Solnechnaya Koalitsiya [The Sunny Coalition] movement, which had been conceived of as a democratic coalition for supporting politico-economic reforms in Uzbekistan. Mr Umarov was arrested in Tashkent on 22 Oct 2005, and was charged with establishing an organised criminal group, embezzling large amounts, false enterprise, forgery and tax evasion. Mr Umarov maintained his innocence on all counts, but was still sentenced to 14 years of imprisonment in March 2006; his term was reduced to 7 years and 9 months due to an amnesty. He was freed from prison in November 2009 thanks to a significant pressure at the international level, efforts by diplomats and international human rights organisations. 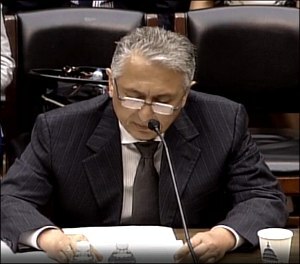 Thank you for inviting me to testify at this hearing. Your Commission is named after a special man, the late Representative Tom Lantos. The only Holocaust survivor who became a Member of Congress, he was renowned throughout the world for his fierce dedication to human rights, and is fondly remembered to this day. Speaking at this event is a great honor for me. The focus of today's hearing is U.S. policy in Central Asia, as Washington completes its drawdown of forces from Afghanistan. Let me begin by expressing certain sympathy for Assistant Secretary Malinowski and Deputy Assistant Secretary Rosenblum. They have a difficult job, especially when it comes to promoting human rights. But U.S. policy has always featured an interlocking combination of goals, even well before September 11, 2001, and the military campaign in Afghanistan. Throughout, Washington has had four basic aims: to support the independence and sovereignty of the states in the region; to cooperate with them in security matters; to develop and marketise Central Asia's vast energy resources and diversify their delivery routes to the outside world; and, to promote democratisation and human rights. Those goals remain in place today, almost 25 years after the collapse of the USSR. Deputy Secretary Blinken's policy statement a few months ago basically reiterated the same priorities, despite a changed international environment. I think any fair-minded observer would conclude that more progress has been made realising the first three than the last. Perhaps the best evidence for that are the State Department's annual reports on human rights, which Secretary Malinowski oversees. Reading the sections on Central Asia is a sobering enterprise. Documented there in detail are the widespread, even systemic violations of human rights by authoritarian, corrupt regimes that have blocked the emergence of institutions that could jeopardize their positions, failed to develop checks and balances, permit democratisation, safeguard human rights, or establish reliable rules for the transfer of power. This generalisation applies to the five regional states to varying degrees but I maintain it is accurate overall. Even more depressing, however, is the realisation that these assessments, and similar investigations by many international NGOs, have changed little over the years. If we look at any country report since 1995 or a description of my own trial, imprisonment and torture, it would seamlessly fit with today’s accounts of the abuse and torture of so many of our brothers and sisters, sons and daughters, and mothers and fathers. This is not an indictment of the U.S. Government or an expression of doubt about its sincerity. Of course, the United States would like to see the spread of democracy around the world. The problem is that Washington has a limited number of instruments to press other capitals to make reforms they strongly oppose out of perceived self interest. I think the experience of the last 25 years demonstrates that American efforts have not succeeded in effecting systemic democratisation in the face of determined resistance by local elites. Moreover, the former Soviet republics have models other than Western democracy to emulate. Russia has gone from a developing democracy back to authoritarianism, and Moscow daily warns its neighbours about the nefarious aims of the United States, which supposedly promotes “colour revolutions”. Nearby China, which shares with Russia an aversion to the basic precepts of liberal democracy, has been playing an ever more important economic role in Central Asia, with growing political implications. Nor should we be deluded about the policy ramifications of the military drawdown from Afghanistan. Will the United States be inclined or able to shift its priorities in Central Asia from security to democracy promotion, just because U.S. troops are leaving Afghanistan? Washington has degraded the leadership of al-Qaeda but the Afghan Taliban remains a serious threat. And with the Islamic State conquering and holding territory in Iraq and Syria, making inroads in other countries, and already drawing several thousand recruits from Central Asia, security will surely remain a top priority. So, I believe, will the emphasis on backing independence. President Putin's assault on Ukraine has signalled a much more threatening Russian approach to neighbouring countries. In this new order, the American commitment to supporting the sovereignty and territorial integrity of Central Asian states will be as important as before. Regional capitals will seek that assurance and Washington should strive to provide it. With regards energy and developing other economic sectors, they will obviously continue to play a critical role in U.S. policy. The New Silk Road Initiative is the latest iteration of a constant focus of attention over decades, along with renewed stress on connectivity and regional integration. Finally, the promotion of democracy is bedrock of U.S. policy throughout the world, even in unfriendly or unappreciative regions. This, too, will continue, no matter whether U.S. troops are based in Afghanistan or not, even when the prospects for success are not encouraging. So barring extraordinary events -- which cannot be excluded, given the age of some of the region's presidents and the lack of reliable succession mechanisms -- we are likely to see more of the same with respect to regional facts on the ground and U.S. policies. Central Asia's leaders and elites will hardly grow less corrupt or more indulgent of criticism, dissent, opposition political activity or an independent judiciary. Most recently, President Karimov of Uzbekistan again orchestrated his re-election, despite Constitutional term limits, and the same can be expected elsewhere in the region. At the same time, the United States will not stop pursuing its security and economic goals in Central Asia because of disappointment over stalled democratisation, no matter how blatant the provocation. This year marks the tenth anniversary of the massacre in Andijon. Yet despite a period of downgraded relations, Washington never sought to cut ties with Tashkent. I think we must recognize that a new day of democratic development is not necessarily about to dawn in Central Asia. This is an especially difficult acknowledgment for me, as a former political prisoner in Uzbekistan. Nobody more than I would welcome change for the better and nobody understands better the consequences of "more of the same." I was a successful businessman in Uzbekistan who stepped into politics in the early 2000s because of the deplorable conditions in the cotton sector. Then, in 2005 I was moved to create the Sunshine Coalition in response to blatant corruption. My attempt to build a large plant for the production of liquid hydrocarbons from natural gas using American technology was blocked when we were told we could only act through the company ZeroMax – which was then controlled by the President's daughter. When I refused to pay a bribe, I was arrested in October 2005. During my pre-trial detention, which lasted four months, I was interrogated continuously, and often beaten. Once, a car backed up to my cell window and pumped in exhaust. My trial on January 30, 2006 was farcical but my sentence was not: fourteen-and-a-half years! I was sent to a prison colony, and placed in solitary confinement in a tiny cell with a concrete floor, an open toilet, and no sink. Whenever my stay in solitary was almost done, officials would extend it for another two or three weeks. This happened repeatedly, over 14 months. Throughout this time, I was not allowed any contact with my family. During my first year in jail, my son tried unsuccessfully to see me 20 times. But my lowest point came in January 2008, when I was thrown in the “monkey cage,” a cell open to the elements. The first time I nearly froze to death. The second time they threw me in there, because I refused to confess that the United States gave me $20 million to overthrow Uzbekistan’s government, they broke my thumb and choked me, permanently damaging my vocal chords. But I refused to sign. Frankly, I lost all hope that I’d ever get out. But one day while I was in the prison hospital, I was summoned to the administration building. To my astonishment, I was released! Just when all seemed lost, I was free and reunited with my family. My story -- a political arrest, trumped up conviction and torture in jail -- all reflect "more of the same." Refusing to pay a bribe to launch a business project that would benefit the country and its people made me dangerous to the authorities. And because I was also trying to reform politics in a country whose leadership refuses to tolerate sincere attempts at reform, I ended up a "prisoner of conscience." So what can the U.S. Government do? What should the U.S. Government do? First, policy should be based on an objective reading of the realities: outside of Kyrgyzstan, today's Central Asian leaders will not voluntarily step down, allow fair elections, or permit the emergence of a robust civil society -- no matter how often or urgently they are exhorted to do so. I see no persuasive evidence that they can be induced or pressured into making systemic reforms. Still, the United States should continue to criticize human rights violations and try to move these countries in a progressive direction. Second, reform will be a long-term process. Apart from youth exchanges, which should supported and expanded, I believe one way to leverage our impact on development is to more actively engage Central Asian parliaments. Of course, they do not play the same role as the U.S. Congress, but the potential, unpredictable benefits are worth the effort. In Uzbekistan, for example, the Oliy Majlis has a critical, albeit formal role in the transfer of power and government make-up. However implausible today, one could imagine a scenario where the Oliy Majlis begins to exercise its natural constitutional role. A generational change in leadership is inevitable. Greater engagement with individuals now in parliament who may in the future play key governmental, security and prosecutorial roles can effectively highlight the US Government’s sincere, long-term goal of democratisation and respect for human rights. I also think we should give certain state-sponsored institutions a chance to prove themselves. Earlier this month, a new Institute for Democracy and Human Rights was established in Tashkent. Of course, the National Human Rights Centre, which has long been Uzbekistan's interlocutor on human rights issues, was merely engaged in whitewashing the country's awful record while promising reforms. But let us at least give this new organisation a chance before concluding it is no better or more effective. In general, Mr Chairman, I do not believe isolation of even the most repressive Central Asian countries is a fruitful course. And with Russia now openly threatening its neighbours, I hope the United States will continue to support their sovereignty and territorial integrity. However critical I might be of my homeland, I share with all Uzbeks a deep commitment to its independence. I also believe that relations should be developed between Central Asian countries and regions in the United States. In my own city of Memphis, Tennessee, a centre is being established that will focus on developing ties with Central Asia. With all respect to Washington, I think regional centres have an important role to play in fostering economic, cultural and educational relations that will help promote democratisation. In the meantime, Washington can and should urge Central Asian countries towards reform but for the foreseeable future, I think this will mostly take the form of seeking the release of political prisoners. This is how I was freed -- not because Uzbek authorities regretted my treatment but because my family organized a campaign of pressure, with the help of Members of Congress, diplomats and international organisations. Eventually Tashkent concluded that my continuing imprisonment and torture were counterproductive. I would like here to note that Congressman Lantos was one of the signers of the resolution on my behalf, which played such an important role in securing my release. I was lucky. Unfortunately, there are many such prisoners in Uzbekistan. Last year, Human Rights Watch issued a sad, eye-opening report on political prisoners in my homeland. I would like here to mention three who deserve American intercession: Muhammad Bekjanov, who is the longest-imprisoned journalist in the world; Rustam Usmanov, head of the first Private Bank “Rustam Bank” in Uzbekistan; and Elena Urlayeva, an incredibly brave human rights activist, who has been harassed for years and jailed many times – and oftentimes committed to psychiatric institutions against her will. On certain other issues, pressure can be effective. In Uzbekistan, for example, the international campaign by retailers against Uzbek cotton has resulted in positive changes, although much remains to be done. Ideally, the problem could be resolved by the use of technology, especially of American origin, that will obviate the need for human labour in picking cotton. In closing, Mr Chairman, my policy suggestions may seem limited. But if I thought broader measures would be effective at this point, I would recommend them. I hope to be able one day to take a more active role in bringing reform to Uzbekistan. But for now, I do what I can to help my native land even as I reside in freedom and security with my family in Tennessee. The Commission is named in honour of the life and legacy of the late Congressman Thomas Peter Lantos (D-CA12). Mr Lantos was the only Holocaust survivor to ever serve in the U.S. Congress (1980 – 2008). He was born in Budapest, Hungary, where as a teenager he was sent to a forced labour camp by the German Nazi occupant military. He escaped the labour camp and sought refuge with an aunt who lived in a safe house operated by Raoul Wallenberg, the Swedish diplomat who used his official status and visa-issuing powers to save thousands of Hungarian Jews. Mr Lantos quickly joined the anti-Nazi resistance. After the Russians liberated Budapest in 1945, Mr Lantos tried to locate his mother and family members, but he gradually came to realize that they had all perished in Holocaust.